The raids were part of an international operation targeting customers of Webstresser, which Europol calls the “world’s biggest marketplace” for distributed denial of service attacks. The site was shut down and its suspected operators arrested in April. The National Crime Agency (NCA) said it planned further action against another 400 suspected UK Webstresser customers. Europol said Webstresser had helped to launch more than four million DDoS attacks, which funnel huge amounts of data at a target to knock it offline, and had more than 151,000 registered customers. Prices to bombard websites started as low as €15 (£13) a month, it added. The NCA said it had issued “cease and desist” notices to many of the people from whom it had seized gadgets. These warn of future legal action, if the recipient continued to carry out web attacks. “We have already identified further suspects linked to the site, and we will continue to take action,” he added. The action against Webstresser customers is part of a broader international push against suspected DDoS-for-hire sites and their users. In December, US police forces charged three men accused of running DDoS services. 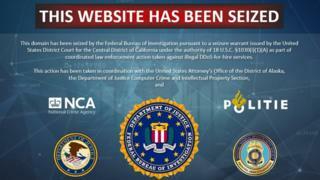 It also shut down 15 sites suspected of offering similar services. Romanian police had also shut down two other suspected DDoS sites and planned to share information seized during raids about their customers, said Europol. Independent security expert Brian Krebs said professional cyber-security organisations had criticised the co-ordinated action against those running DDoS or “booter” services and their customers. “The vast majority of both groups are young men under the age of 21 and are using booter services to settle petty disputes over online games,” he wrote. Instead, he said, some had called on police to tackle “more serious cyber-criminals”.